Working festivals is never easy. It can be fun, but it’s not easy. Working four day long festivals with just a pup for company is even harder. 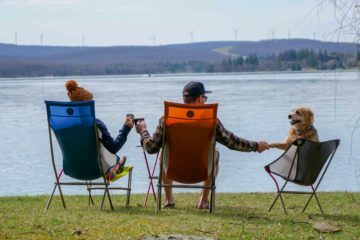 This weekend Roxy took a break to celebrate her best friend’s wedding while Henry and I held down the fort at Americas Oldest Whitewater Festival– FIBArk. The Arkansas River Valley, specifically the area between Buena Vista, Colorado and Salida, Colorado, is one of our favorite areas in the state. It’s hard to beat sleeping at the feet of the Collegiate Peaks. Henry and I had a few free days prior to the festival so we took advantage of it by going on as many hikes as possible. One of my favorite things about hiking in this particular area is the variety of landscapes you hike through on your way up a mountain. You can start in what feels like a desert and in just a couple of hours transition into a beautiful, pristine high alpine wilderness. It also gave us the opportunity to camp in one of our favorite areas for van camping… I won’t say where it is, but if you come chat with us at a festival and maybe I’ll let you in on our secret… MAYBE. FIBArk stands for “First in Boating the Arkansas.” According to Wikipedia, the origin of the festival stems from a bet in 1949. 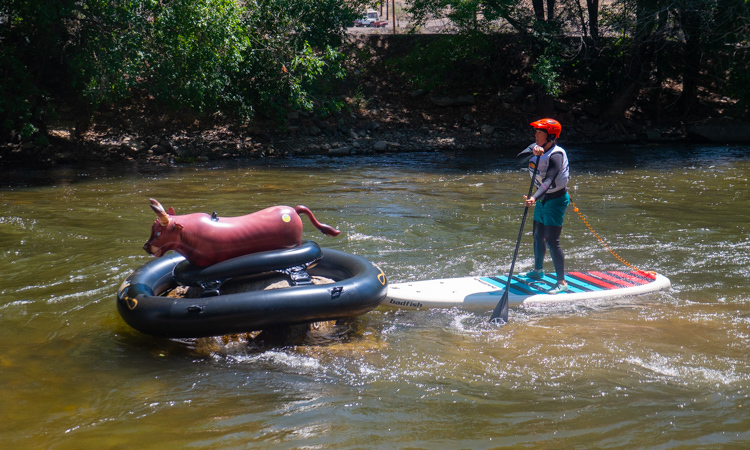 Two friends bet each other who’d win a race down the Arkansas River from Salida to Cañon City. It almost killed both of them. Starting as a race with only 23 competitors, the festival has grown immensely since the beginning. 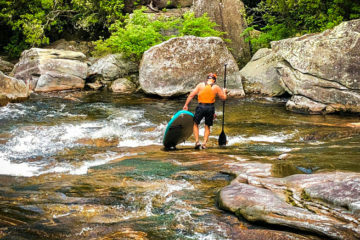 The festival is more than just boating, although whitewater is still the focus. 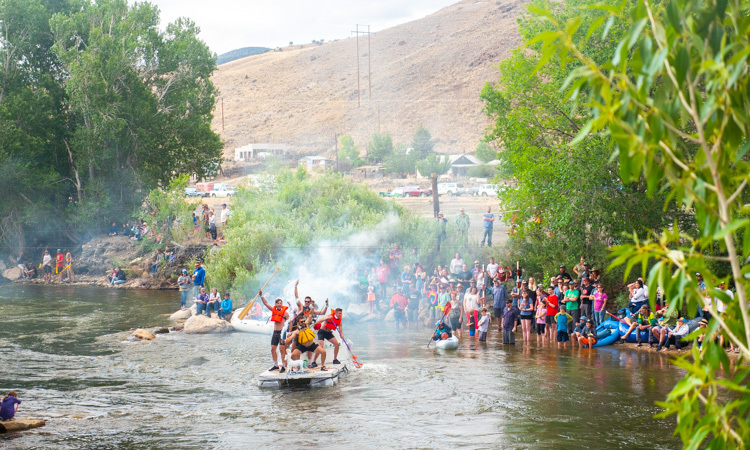 At FIBArk, you’ll find bike races, foot races, SUP boxing, and of course, the wildly popular hooligan race where teams come together and build their own boats to get themselves down the river. Teams are allowed to use anything besides traditional boat material. In between boaters, crazy people on bikes backflip into the river. Salida, much like the rest of the Western United States, is extremely dry right now. Much of the talk of the weekend was about the fire ban, dry weather, and hoping for rain. There were a few times throughout the weekend where it looked like we might get our wish, but the clouds seemed to vanish once they dropped down from the mountains. All weekend I chatted with through hikers on the Continental Divide Trail who were stopping through town to re-supply on their way north. 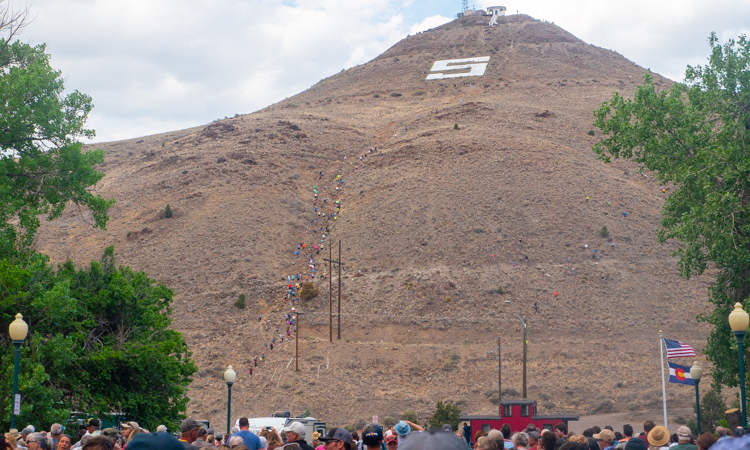 The majority of them just barely made it through the San Juans before the stage 3 fire ban closed the National Forest to the public. They were all relieved to have made it to my booth, where I promptly loaded them all down with Mountain House samples. I think word got out at the hostel down the street because more and more hikers kept stopping by saying they heard something about Mountain House in the park. I’m always happy to help out through hikers. They seem to appreciate it the most. 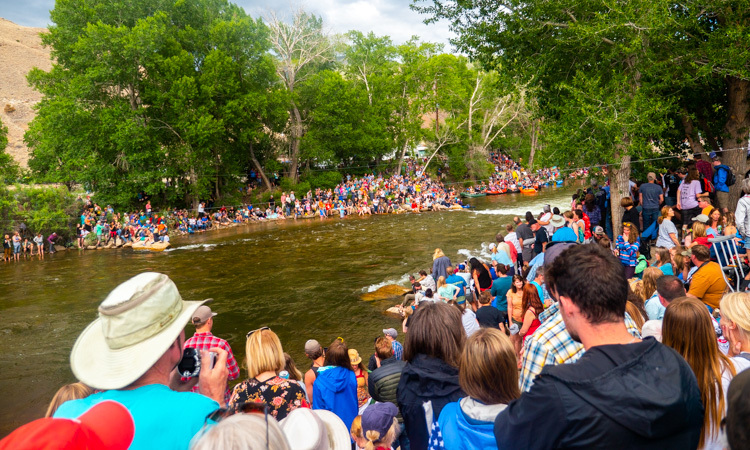 Aside from the classic whitewater events, there were also carnival rides for the kids, live music and beer for the adults, and an art market stocked full of local, handmade goods. 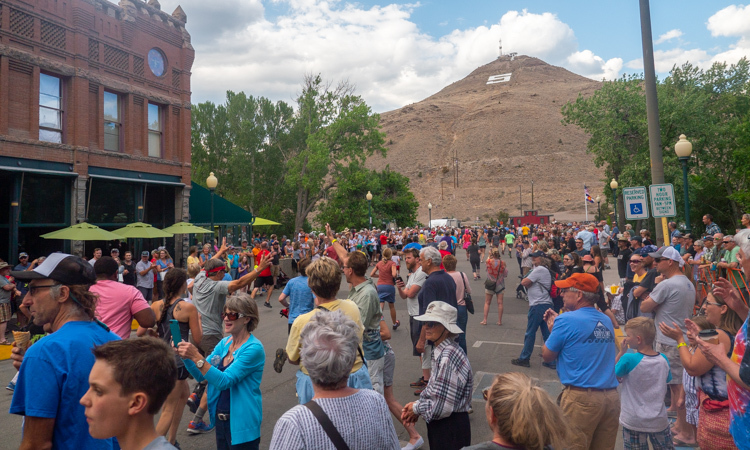 Salida is a welcoming town and it feels like home. The summer is still young and I’m sure we’ll be back before the end of the tour. 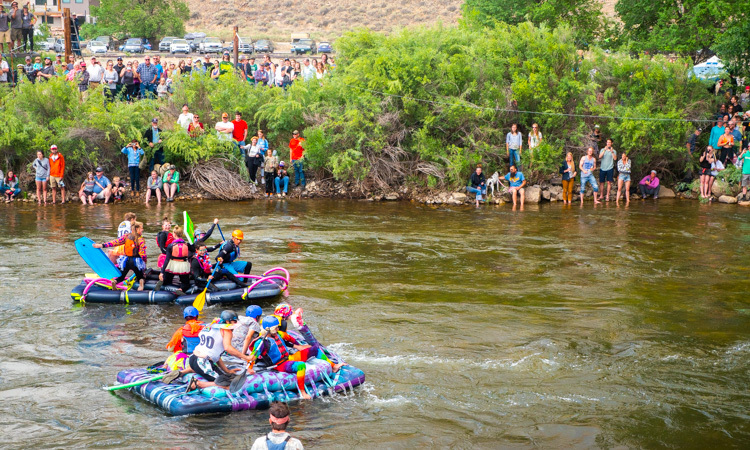 Next up we’re headed to Gunnison for the Gunnison River Festival from June 22nd-24th. See you there! There is one way for this tour to be a reality, our sponsors! 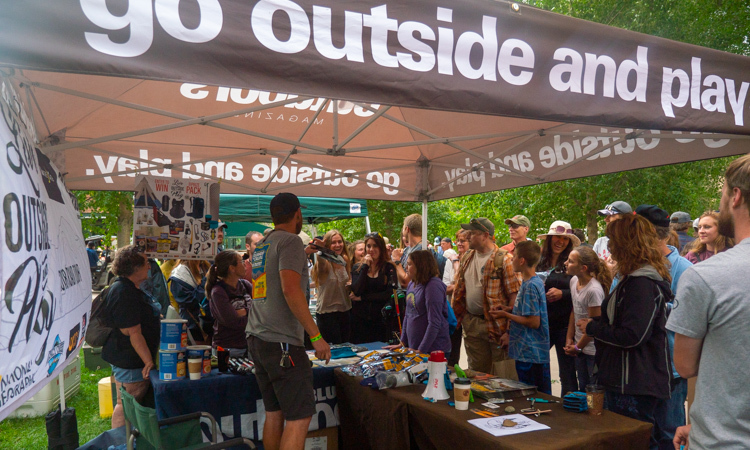 Sending a thank you shout out to our title sponsor Nite Ize, and all of our other awesome sponsors that make this happen: Crazy Creek, National Geographic, Sea to Summit, Mountain House, Lowe Alpine, Old Town, Leki, HydraPak, UCO Gear and Wenzel. If you like the gear that keeps us groovin’ click here to enter for a chance to win our Grand Gear Giveaway!